The first machine-guns were a heavy piece of kit made as robust as possible and designed to survive the mud and dirt of the battlefield. Though simple, these devices were horribly effective bearing in mind the infantry tactics of the day; moreover, they were capable of firing for hour after hour, inflicting horrific casualties. One of the most memorable weapons of the First World War certainly is a water-cooled Maxim machine gun which invention brought the industrial-strength killing to the battlefield. More than any other firearm developed in the late 19th or early 20th Century, the Maxim gun with the water-cooling system as an essential part of early machine gun technology is responsible for changing the nature of warfare forever. 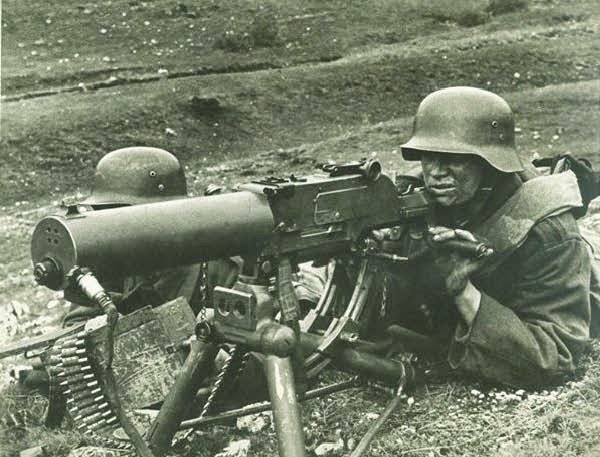 Machine guns were one of the main killers in the war, so it is not surprising that some historians called World War I “the machine gun war”- but to be honest, artillery fire often caused the bulk of the casualties. During the early clashes on Western Front, the machine guns inflicted appalling casualties on both war sides, utilizing unique tactics and organization that in fact, become more like those of the artillery than of the infantry. Interestingly, most of the important first-generation automatic guns were the work of Americans. The most famous gunmaker was Hiram Stevens Maxim, an inveterate genius, and a shrewd businessman who found glory and success in Europe. In fact, his method of harnessing a gun`s recoil was most widespread from 1883 until the second decade of the 20th century. Since Hiram Maxim, was by far the important among others American firearms pioneers, if only by primacy, John Moses Browning was indisputably the more talented gunmaker and soon came up with a new way of utilizing the same short recoil system using a simpler method of locking breechblock and barrel than Maxim had used. However, the majority or machine guns employed during Great War were basically Maxims of one sort or another. The superbly engineered weapons like the German Spandau (Maxim-Maschinengewehr – a copy of Maxim) or the British Vickers machine guns have dominated infantry fighting on the Western Front during the Great War. When the Americans entered the WWI on April 6, 1917, the U.S. Army was faced with a shortage of machine guns, and for the United States that was entering a Great War being fought with machine guns, the situation was critical. As most of the major combatant nations developed their own machine guns by 1916, the Army Ordnance Department had urgent trials for a machine-gun that could provide the infantry with necessary extra firepower. Looking for an affordable LPVO? See ourVortex Strike Eagle review. 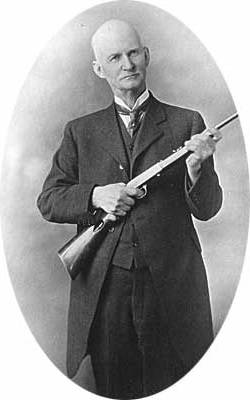 John Moses Browning, a tireless innovator and sometimes referred to as the “father of modern firearms,” offered his recoil operated and water-cooled machine gun for the test. After a detailed examination, the gun fired 40,000 rounds without a malfunction and on another test; Mr. Browning fired the gun personally for 48 minutes in sustained fire regime with no stoppages known to nowadays gun aficionados as ‘FTF’ or ‘FTE’ (Failure to EJECT or Failure to FIRE). Ultimately, this arguably the greatest firearm designer got the contract for the machine gun that will be known as the Browning M1917 .30 caliber heavy machine gun. The Browning machine gun was the last new successful water-cooled gun to be introduced and rather similar in exterior and performance to the British, German and Russian Maxims, but it succeeded where the Maxims and its clones failed, however, for it successfully made the conversion from water-cooling to air-cooling. 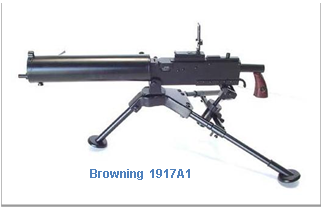 After the First World War, the liquid-cooled Browning 1917, a timeless classic among the best machine guns, became the US Army and Marine Corps standard heavy machine gun. Nevertheless, featuring cumbersome water jackets and heavy tripods, the water-cooled machine-guns as key weapons from the World War I, soon became “passé,” and all the successful new designs introduced after the Armistice was, without exception, air-cooled. While the heavy, water-cooled machine-guns were one of the leading causes of a static, trench warfare, light machine-guns helped to restore mobility despite the fact that they tended to overheat if used too enthusiastically. Deciding between Vortex Venom and Viper? See ourVortex Venom vs Viper. Accordingly, the Browning M1917 machine-gun though reliable battlefield weapon, lost its water jacket early on, and its air-cooled version has been developed in 1918-19 to arm the Mark VIII series of tanks – the joint post-war British-American tank. From this work emerged the Browning M1919, though it appeared just too late to see action in World War I, but was to have a very long combat career indeed, right through World War II and beyond, as an infantry machine gun and also as a multi-platform weapon. The first tank version had shortened barrel from standard 24 in (609 mm) to 18 in (457mm) and featured a perforated jacket and a small tripod so that gun could be used outside a tank. Eventually, in that arrangement, army officials were convinced that air-cooled guns could work as well as water-cooled machine guns. The M1919 being air-cooled, belt-fed and based on well-tried components initially fired the .30 cal M1906 (.30-06 Springfield) ball cartridge, and due to the cartridge caliber it shot, the gun was commonly called the “.30 Cal”, but its official nomenclature was Caliber .30, Tank Machine Gun Model of 1919. With the cessation of hostilities, the conservative U.S. Army of the day desired only an air-cooled variation for infantry and cavalry units, while the various machine guns and the old workhorses like the Vickers, Lewis, Marlin, and others were one by one declared obsolete. The Browning M1919 machine gun survived beyond the war years and remained as the United States’ standard medium machine gun (MMG). The first modifications to the base M1919 design were made in 1931 when the tank gun was adapted for ground use by fitting the attachable stocks (nothing like the following A6 stocks), a handgrip under the receiver and the front sight with sight brackets were mounted on the front of the receiver. The model called M1919A1 had cycle rate of about 600 rounds per minute and weighed about 40 lb. with a tripod. Looking for an affordable Aimpoint? See ourAimpoint PRO review. Since the mechanized warfare eclipsed the cavalry in great number, they were desperate to increase the combat power of mounted troops. Eventually, they adopted in 1931, slightly improved machine gun with a more compact M2 tripod assembly and adjusted for travel by way of a pack animal and wheeled carriage. That iteration sometimes referred to as the “Cavalry Model, officially was named the M1919A2. In the constant rivalry, the infantry also climbed on the bandwagon when ordered 72 trial samples of the tank guns but with 24 inches barrel, the same length as the venerable M1917, to achieve the full potential of both the M1 Ball and the M2 Ball of .30-06 cartridges. There are no other external differences to M1919A2, except this model has the front sight moved back to the receiver. Being known as the M1919A3, this prototype version for infantry use is never put into production, but its development led to the M1919A4. Looking for a mini red dot? See ourVortex Venom review. Because of these modifications, a definitive version of the gun followed in 1934, the legendary chain belt bullet feed M1919A4. 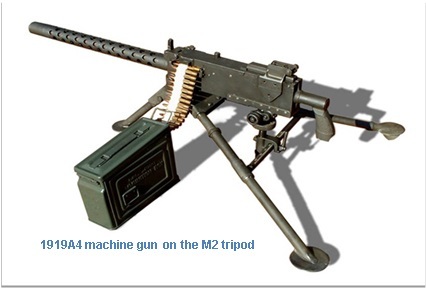 The M1919A4 machine gun was issued to both armor and infantry units for use as both a fixed vehicle and aircraft gun or on a tripod mounting for flexible fire. The most common version of the Browning M1919 has a full designation in the United States Army: the Machine Gun, caliber .30, H.B. M1919A4 (H.B. for the heavy barrel) featured now standard 24 inches thick barrel, and weight of weapon with pintle and elevating mechanism was 31 pounds (14kg). A pintle assembly is a mounting platform that allows the gun to be freely traversed. At the same time, the M1919A4 combined the classic and revolutionary design of air-cooled, recoil operated and belt-fed system while keeping the machine gun receiver the same as the earlier “Heavy” Browning machine gun, the liquid cooled 1917 series. Original M1919A4s featured a 250 round cloth belt and different heat shield with horizontal slots contrary to the circular perforations found on the later of M1919s. Early M1919A4s was supplied with a rotating notched bar on the right side of the receiver, which was used to keep the bolt in the open position to prevent cartridge cook-offs in a hot barrel. Obviously, the air cooling system was less efficient making the 1919A4 less capable of sustained fire than the water-cooled 1917. While the rate of fire for heavy barrel M1914A4 weapon was 400-550 rounds per minute, the usable rate of fire was 150 rounds per minute, and it could be kept up for about 15 minutes, but faster rates of fire could only be maintained for short periods. Alternatively, the machine gun could operate for approximately 30 minutes at a slow rate of fire of about 60 rounds per minute. Looking for an affordable scope? See ourVortex Crossfire ii Review. This gun is a modified version of the M1919A4 developed specifically for vehicular use with the Stuart M3 Light Tank. The manufacturer, the Rock Island Arsenal, designed a new style of bolt retracting handle assembly. The M1919A5 was produced between May of 1942 and May of 1943. However M1919A5 production ceased because its primary user, the M3A1 Stewart tank, was declared obsolete in November 1943. 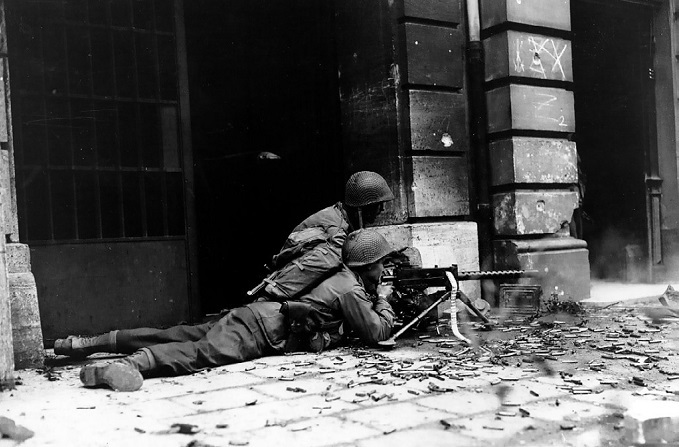 All US military personnel in World War II used the Browning M1919 as a rifle company weapon designed to deliver automatic fire at close and mid-ranges in a number of configurations. This crew-served weapon was utilized as a direct fire weapon that could use its high rate of fire to nail down enemy troops and machine guns effectively. But Army was looking for a machine gun that would be more portable with a reduced amount of weight soldiers had to haul around the battlefield. Just like other renowned pod mounted machine guns, the M1919A4 was the forerunner to the M1919A6 mobile, air-cooled ground machine gun capable of being operated by one or two men. Eventually, during the Second World War, in April 1943, the M1919A6 was introduced as a light machine gun to increase the firepower of the battalion. The gun was marked US INSP BROWNING MACHINE GUN US CAL 30” on the left side of the receiver. Basically, it was M1919A4 Model fitted with a lightened barrel, wood shoulder stock for better accuracy, a bipod, instead of a tripod, conical flash hider, and a carrying handle for mobile firepower. This gun was an American attempt to make a light machine gun that could be carried by one man, but at 32.5-pounds (15kg) unloaded calling the M1919A6, a light machine gun was truly ironic to front-line troops. It was intended to be used for the technique called the “assault fire” or as French Army describe a tactic of ‘walking fire’ where light machine gunners would keep up a continuous suppressive fire on the enemy as they run across No Man’s Land. Anyway, this unsuccessful and disappointing American version of the German MG34 and MG42 “universal machine gun” saw use in European Theater during Second World War, but not nearly as much use as the Browning M1919A4. However, both the A4 and A6 were replaced by the lighter, more reliable M60 during the Vietnam War era. Deciding between Aimpoint T1 and T2? See ourAimpoint T1 Vs T2. The Browning M1919 machine gun survived beyond the Second World War years in its various iterations, and its original form has had a significant influence on the design of other notable weaponry. This workhorse and an unforgettable classic became the standard ground gun for all arms in the late 1930s, and it is still in use today in various parts of the world, some modified to 7.62mm NATO and other calibers, and they will undoubtedly be around for many years to come.